Saint Barbara's wheat, tradition of Provence during Christmas. Sowing wheat on Saint Barbara’s day, 20 days before Christmas, still is one of the widely followed “calendale” tradition of Provence. This tradition dates back to Roman days and has it that if wheat germinates well and if wheat is green, then the harvest will be plentiful. But where does this tradition originate ? Saint Barbara was the daughter of Dioscore. Young and pretty she was much courted in Provence. However to her father’s great displeasure she chose to serve God instead of men. Dioscore had her locked up in a tower lit up by two windows only where she managed nonetheless to receive a Christian teaching and to be baptised. Hearing of this her father threatens her with his sword but managed to run away and hide in the cavity of roc which, as the legend goes, opened up to give her shelter. She was, however, reported by a shepherd who was punished by having heis sheep transformed into a swarm of grasshoppers. She was imprisoned again and compelled to marry a pagan. Refusing to disown her God she was a victim of numerous tortures and finally her own father beheaded her. Dioscore was then struck by lightning as a Heavenly punishment. In order never to forget Saint Barbara the people of Provence sow wheat in three small dishes on the day of Saint Barbara (in 1969 the Church changed the original name of Barbe into Barbara) that is the 4th of December. 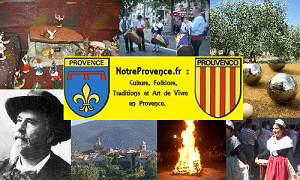 This is the beginning of the “Calendale” (Christmas) celebrations in Provence. 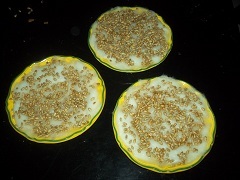 During the Great Supper, the three dishes with wheat seeds are put on the table. They symbolize the Holy Trinity also found in other local traditions. According to the tradition if the wheat has well germinated on the 25th of December then the following harvest will be generous. On this occasion they also say that “if the wheat goes well, everything goes well”. 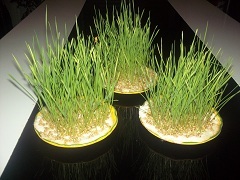 If you wish to grow wheat you can get it to germinate in small dishes covered with cotton soaked in water. 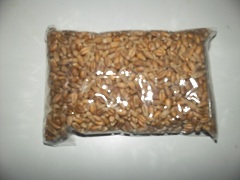 Small bags of wheat seeds are available at all baker’s who sell them to the benefit of humanitarian projects. Keep the cotton wet but do not drown the seeds in water; and some more advise to obtain well germinate wheat on Christmas day do not sow it on Saint Barbara’s day but a week later because in our well heated homes it would have grown too much and you would need to prop it up for it not to sag !